Nearly 12 days after achieving China's first automated docking in orbit, the unmanned Shenzhou 8 spaceship will attempt a more daring daylight link-up Monday with a target module 200 miles above Earth. Flying on autopilot, the Shenzhou 8 spacecraft will separate from the Tiangong 1 laboratory some time Monday and retreat 140 meters, or about 459 feet. Then Shenzhou 8's high-tech navigation sensors and guidance computer will fly the craft back toward Tiangong 1 for a docking in sunlight, according to Chinese space officials. The state-owned Xinhua news agency reported the docked spacecraft adjusted their orbit Sunday to prepare for the second rendezvous demonstration. The spacecraft are both in good condition and ready for Monday's docking test, according to Xinhua. Ma Yongping, vice director of the Beijing Aerospace Control Center, told Xinhua the separation and redocking sequence would last approximately 30 minutes. Shenzhou 8's rendezvous system relies on computers to automatically process navigation data from a high-tech suite of radar, laser and optical sensors designed to collect information on the range and closing rate between Shenzhou 8 and Tiangong 1. In the moments before docking, the spacecraft should approach each other at less than one-half mile per hour, or approximately 20 centimeters per second. The alignment between the vehicles must be within 7 inches, according to Chinese engineers. A ring deployed in front of Shenzhou 8's nose will first make contact with Tiangong 1, then a robotic system will bring the craft together and drive latches to create a firm connection. The Shenzhou docking ring is similar to the Russian-designed APAS system, which was used in the joint U.S.-Soviet Apollo-Soyuz Test Project, the assembly of the Russian space station Mir and by space shuttles visiting the International Space Station. The androgynous docking system is designed so either spacecraft can be active or passive, but Shenzhou 8 will be the active vehicle Monday. Shenzhou 8 and Tiangong 1 will remain together for two days, then Shenzhou 8 will undock and its re-entry capsule will parachute back to Earth on Nov. 17. 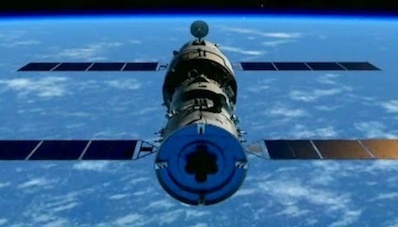 After launching Oct. 31 from the Chinese Gobi desert, Shenzhou 8 conducted an automatic docking with Tiangong 1 on Nov. 2. The link-up occurred during a night pass as the craft orbited over Chinese ground stations. Monday's redocking will test the ability of Shenzhou 8's sensors to operate in poor lighting conditions with solar glare. The spacecraft have stayed latched together since then, forming a pairing stretching more than 60 feet long and up to 13 feet in diameter. Tiangong 1 was designed to control the stack during the docked phase with advanced control moment gyroscopes to maintain its orientation in space without using precious rocket propellant. The vehicles were also expected to share electricity and other resources. The historic Chinese docking trials will set the stage for one or two manned missions next year, which may include China's first female astronaut. The crews will fly into space on Shenzhou spacecraft and manually dock with Tiangong 1 for short-duration research and test missions. China has mounted three human space voyages since it joined the space-faring club in 2003. The most recent mission in 2008 included China's first spacewalk. The proof of Chinese rendezvous and docking technology is crucial to the nation's plans of developing a 100-ton space station and assembling it in orbit by 2020.